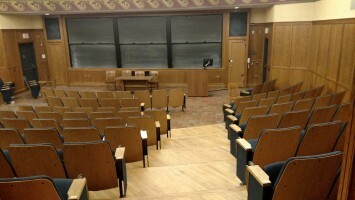 According to a 2015 study by the Pell Institute for the Study of Opportunity in Education and the Penn Alliance for Higher Education and Democracy, only nine percent of those who are born in the bottom income quartile will graduate with a college degree, with some estimates as low as six percent. In his book Tearing Down the Gates: Confronting the Class Divide, Peter Sacks argues the number has been fixed at six percent since 1970. Even lower is the percentage of low income students that attend elite universities according to a Jack Kent Cooke report that notes low income students make up three percent of the enrollment at the most selective colleges, while wealthy students made up 72 percent. Even when low income students excel in school, they are still less likely to attend college than low achieving wealthy students. There are fewer low income students at these schools than there would be if the high achieving low income students applied to selective schools matching their skills. When low income students do attend higher supplemental educational services schools there appear to be some inherent drawbacks. These drawbacks include students feeling like social outcasts. Low income students benefit the most by attending elite institutions. There’s nothing inherently wrong with having wealthy students in attendance. There is a tension as universities benefit from students that have families that can pay most, if not all of, their tuition. The average family at Yale is upper-middle class. That is not close to what the background of the average American. The overrepresentation of the wealthy in universities creates a false notion that most high-achieving students are wealthy. It is important to remember first-generation college students represent a diverse group of students along race and geographic location. Be honest about the experiences your students may have. American University noted the lukewarm experiences alumni have had at the school and established the Reinventing the Student Experience (RiSE) initiative to increase their devotion to giving students the support they need to excel. This exercise could be the focus of a committee or staff retreat. We can collect student feedback via anonymous surveys filled out by first generation, low income college students. Professors can establish mandatory office hours to connect with student. Professors are the gatekeepers of the academic experience and first generation college students may not know how to navigate the professor-student relationship. By normalizing office hours, first generation college students will be more likely to seek help if needed and to establish a relationship with the professor, which is common mindset for students who had parents who graduated college. Professor engagement is also important because professors often don’t consider the backgrounds of the students they are teaching. They may assume information of knowledge that students may not have been exposed to prior to college. A misunderstanding of expectations can hinder first generation college student’s academic achievement as they can do the work, but may not know the academic jargon. If possible, professors should give examples. It is not likely professors consider the background of their students which for a while has been reasonable as our schools have been homogenous when it comes to socioeconomic class. Poor students attend and graduate college at very low rates. Administrators should create a centralized set of support for first generation college students. Too often students may go through most of their time in college to learn in their last year about the resources that were available to them. It is important to think of resources that may not be well publicized, but have already been set aside for students in need. It is also helpful to have a point of contact in the administration for first generation college students. Schools may approach this differently, but it would be ideal to have a staff member or establish an office for first-gen students. Poverty is the most insistent opponent. Let us not trip our students who have run such a hard race by not giving them the right gear to compete at the highest levels. With the ancient doors to these institutions opening to a more diverse student body, we must ensure there are not additional locks awaiting our students.